that Gary Moore, CEO, has always desired to add was Ford, but due to the manner in which contractual relationships are formed in this industry, the timing simply has not been advantageous to either party, that is, until now. Ford and Moore Transport will begin their relationship in the Eastern United States. It is the belief that this relationship will benefit both parties and Moore looks forward to adding a very dynamic customer to a very dynamic network. 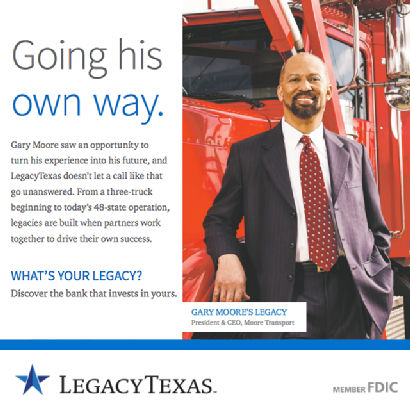 LegacyTexas Bank has been the primary banking relationship since 2012 and has been instrumental in the growth sustained within the organization. The Company looks forward to the value that having a partnership with LegacyTexas will bring as we continue that partnership into the future. across the United States. Moore Transport will become one of their newest partners and will be just a stone-throw away in the neighboring town of Richardson Texas. in the overall movements in the North Eastern United States for Moore Transportation. The relationship will dramatically increase the eastbound synergy Moore needs to enhance potential relationships out of that territory. The relationship incorporates all of the contracts for hauling the Jeep products along with Chrysler and Dodge brands throughout the entire Northeastern USA along with the FIAT brand out of the Baltimore area that are both terminal to terminal moves along with dealership deliveries to Ohio and the states surrounding it. Mr. Moore states, “Our relationship with Chrysler is the main reason we made a choice to house our main terminal in Toledo. We will be able to house a large portion of our fleet in the Toledo area and have the capability to meet Chrysler’s needs both now and far into the future. In addition to the Toledo investment, I am currently reviewing plans for our future move into the south. We have an existing contract with Chrysler that will put us deep in the South. It begins in August, but we are not quite ready to for an announcement at this time.“ Moore Transport also has a contractual obligation with Chrysler in the Baltimore area where Mr. Moore also mentioned that the company is reviewing its current lease obligations in the Baltimore area as they may need to further enhance their pressence in that area. During the interim phase of the new construction, Moore has leased a short-term property blocks away from the Toledo Chrysler Plant. “We saw a need for a facility that would put us right in the middle of where the action is with regard to the Chrysler product family. With its central location to all of our main route destinations along with the City’s eagerness for us to build here, it simply made perfect sense for us to plant our flag of operations here in Toledo.” Said Gary Moore, Owner of Moore Transport. The City of Toledo is proud to engage Moore Transport of Tulsa, LLC, to become a large employer within the city. Moore Transport intends to add several positions to the City in the capacity of operations, dispatch, and long-haul drivers.